Chiang Rai | THP Travels | Ramblings and travel photography. Chiang Rai – Bamboo-cooked lunch, The White Temple and Black House. Early arrival in Chiang Rai was welcoming, although we were a bit frazzled from the 5 1/2 hours of crazy driving from Pai via Chiang Mai. Not too happy to be dropped off 8km out of the centre, but after a bit of asking about we find there are frequent shared taxies to the centre for a pittance. We had looked up a place to stay – Chat Guest House – before we left Pai and had sent an email to enquire about availability – unknowing to whether they got our mail or not, and whether they have a spare room we went directly there. We were in luck and they had reserved a room for us, and when settled in and connecting to their Wi-Fi we got the confirmation e-mail… Chat guesthouse is a lovely little place with friendly staff, and the room was quite nice too. We were quick to book up a couple of trips with them. We booked a day’s trek and a day’s sightseeing. The first afternoon – after we’d settled in and booked our adventures – we did a walkabout to see some temples, but didn’t get as much done as we’d hoped for. The next day we hired a scooter for the day and whizzed around a bit to see the Asean Flower Festival and floating market (although it wasn’t much floating going on… The stalls were on a path between two small bonds). After the market we went to see the Kings Monument and then the Hill Tribe Museum – a nice little museum with a wealth of information about the various tribes and their origins. After a complimentary coffee/tea downstairs in the Cabbages & Condoms Cafe we again got onto our scooter and headed for the Mae Fah Luang Art and Culture Park, which we just missed the opening times of, so had to skip that one and continue to the next stop Chiang Rai Beach. Not so much of a beach really, but it had a row of terraces where you could sit down and order food and drinks – feeling a bit peckish and thirsty we ordered some grilled chicken and sticky rice, with accompanying bottles of Leo Beer of course. The light was vanishing and it was time to get back to freshen up before going out to see the New Year celebrations by the Chiang Rai Clock Tower. We first headed down to the night market for some food before the New Year celebrations and after that we went to the Teepee Bar, a quirky little bar we’d noticed by chance on walking to our guest house on our arrival – if you ever find yourself in Chiang Rai I can recommend this one. After a few beers there we continued to Cat Bar, a bar recommended by the Lonely Planet – what-a-mistake-to-make (Italian accent intended) – it turns out to be a go-go-bar on quite a seedy road and we’re not impressed by this recommendation, so after a very quick beer – left half of it – we move on towards the Clock Tower and stop by a much nicer Rasta Bar for another beer while awaiting the midnight kick-off. The area around the Clock Tower is absolutely ram-packed and it’s very difficult to move around, but we get into the crowd to count down the last seconds of 2012. After the finale we have a little walk around the centre of Chiang Rai, but are a bit conscious about the fact we have an early start in the morning for our jungle trek, not the ideal situation for a hangover exactly. So, on the 1st of January we have an early start trekking through many hill-tribe villages and through the jungle. We’re also joined by one more traveller Megan on a break from working at STA. Our guide Chai also picks up a friend and helper Chang, a Lisu tribesman, on the way to the start-point. Large parts of the trek are easy, and then there are parts where we get the heart pumping and lactic acid in the legs – it’s good variation of exercise and when we arrive at a waterfall it’s nice to have a dip to cool down and wash off some sweat. We have a quick stop in Chang’s village and have tea at his mum’s house – which is very nice – and Chai tells us it’s possible to have a home stay here if going for a two-day trek. All along the route Chang goes off the track, and we can hear him chopping things down and collecting things – we don’t really know why, but we can see him crafting objects out of bamboo with his machete. When we sit down for lunch in the jungle we realise what he’s been up to – he’s made us all a little cutlery-set and cups while walking with us (good multi-tasking) and when we arrive at the spot where we break for lunch Chang and Chai together quickly makes up more containers for serving the food, eating bowls, and a container for cooking water and tea from leaves Chang collected earlier – again all out of bamboo of course – we’re starting to realise how versatile the bamboo is. After a very lovely lunch we started to head back down from the mountains and back towards civilisation, and at the end of our trek we stop by a hot-spring where we can soak in the warm mineral waters (it does smell a bit like rotten eggs, but you get used to it) – it’s certainly nice for softening up the muscles. Next morning we have a full day sightseeing trip with a very nice guide Wisanu, or Mr. M. as he likes to call himself. Wisanu can tell us that he was taught in the business as a guide by Chai, the guide that took us trekking the day before. He tells us how he only two years ago started as a driver without much knowledge of English and had to call Chai whenever he needed to communicate with the people he was driving around. It’s quite astonishing how good his English is – we can’t quite believe he’s only had two years of learning the language. Our first stop of the day is The White Temple, a creation by the artist Chalermchai Kositpipat which we meet and say hello to while walking about in one of the galleries. Although not yet completed (60 more years to go) it’s quite a magnificent temple, all in bright white with mirror inlays it literally shines like a huge jewel in the bright sunlight. We have a good look around inside the temple with its massive mural depicting George W. Bush and Osama Bin Laden as reflections in the eyes of the Devil. After The White temple we go to a very contrasting place called The Black House, a collection of houses and artworks of the artist Thawan Duchanee, which we also see while walking about on the grounds – and unlike the creator of The White Temple Chalermchai Kositpipat this is apparently a rare sight as he’s a very private person. For some reason he was in a good mood that day and were to be seen sitting in one of the houses talking to some of his fans. The Black House is a fitting name for these houses and the art within – it’s really dark – it’s a bit like Twin Peaks and Viking style rolled into one. Next is a stop at The Golden Triangle and on the top of a hill we get a view of the triangle border where it’s split between Myanmar (Burma), Laos and Thailand by the Mekong River. We also visit the Opium Museum – where we learn a lot about the history of the opium trade and the effects it’s had on the people in this area. Our last two stops are located close to each other, the first being Sinakarintra Stit Mahasantikhiri Pagoda on the top of a mountain above the Chinese village Mae Salong Nok our last official stop. This mountain village specialises in tea and coffee, and there are plenty market stalls where you can sample the teas – very nice and aromatic teas, again we wish we could buy some to take home, but no space in our already overstuffed backpacks. Strange enough I can’t see any stalls where you can sample coffee, but there are loads of other spices, sweets and various roasted nuts. Our guide Wisanu recommends the butter-roasted almonds at the stall we have a tea-tasting and they’re dangerously good, so we end up with a bag of these and some very nicely roasted peanuts in their shells from another stall. After the Mae Salong Nok village we start the journey back to Chiang Rai, but as a little extra we have a quick stop at a tea plantation with a good view of the valley below – after this it’s time to go back to the guesthouse for a rest after a full day of sightseeing. Next day we’re off to Chiang Khong to cross over to Laos. By local bus we take the two hour journey up to Chiang Khong, and eager to get the border-crossing over and done with we head straight up to the ferry-crossing over to Huay Xai. After a bit back-and-forth to organise payment of our visas in Laos Kip rather than US Dollars (they make it difficult for you to pay in the local currency, because they prefer you to pay in USD) but we’re persistent and finally get our visas paid in Kip, which saves us a couple of pounds as well as supporting their economy rather than a foreign economy, and this gives us a bit of a good feeling as well of course. There are no night-busses towards our next main destination, so we settle in a nice guest house called Sabaydee for the night and get our bus to Luang Prabang through them as well. Next day we’re off on a very long bus journey – it’s supposed to be eight hours and we’re supposed to arrive at ten in the evening. We arrive after a 14 hour long journey we arrive like zombies at four in the morning when absolutely everything is closed – not much fun… but we’re glad to finally be there. Wat Phra Kaeo, Chiang Rai. Wat Doi Ngam Muang, Chiang Rai. At the Asean Flower Festival in Chiang Rai. The Kings Monument in Chiang Rai. At Cabbages & Condoms cafe in Chiang Rai. Hannah at Chiang Rai Beach. Hannah at the Teepee Bar on New Years Eve in Chiang Rai. 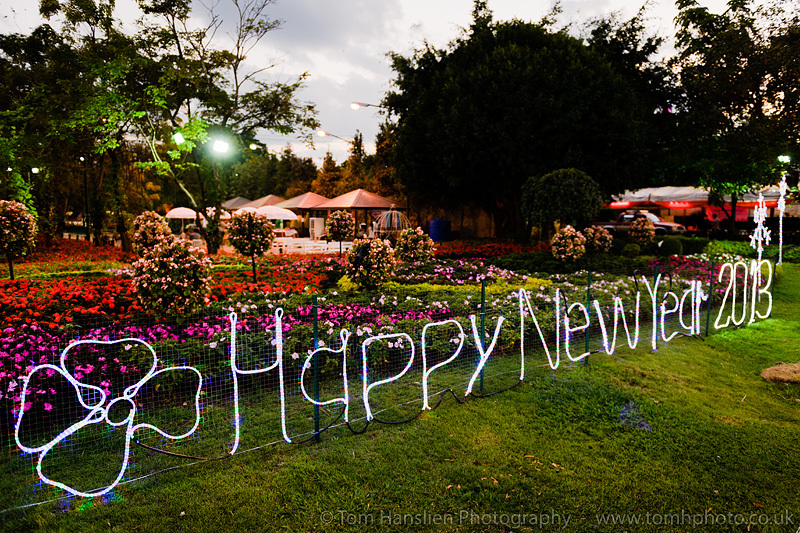 New Years Eve in Chiang Rai. People setting off flying lanterns. New Years Eve in Chiang Rai. Trekking in the jungle around Chiang Rai. Trekking in the jungle around Chiang Rai. Hannah and Megan in one of the hill-tribe villages. Trekking in the jungle around Chiang Rai. Having a cool-down in the waterfall. Trekking in the jungle around Chiang Rai. Hannah having a dip in the waterfall. Trekking in the jungle around Chiang Rai. Hannah and Megan cooling down in the waterfall. Trekking in the jungle around Chiang Rai. Tea plantations. Trekking in the jungle around Chiang Rai. Hannah, Megan and Chai climbing up a very steep hill. Trekking in the jungle around Chiang Rai. Chai getting the fire started. Trekking in the jungle around Chiang Rai. Prepairing our lunch. Trekking in the jungle around Chiang Rai. Chai and Chang prepairing our lunch. Trekking in the jungle around Chiang Rai. A very delicious lunch. Hannah trekking in the jungle around Chiang Rai. Trekking in the jungle around Chiang Rai. Rubber-tree plantation. The White Temple (Wat Rong Khun), Pa O Don Chai, Chiang Rai. The workshop at The White Temple (Wat Rong Khun), Pa O Don Chai, Chiang Rai. The creator of the White Temple (Wat Rong Khun) Chalermchai Kositpipat posing with some of the public, Pa O Don Chai, Chiang Rai. The Black House, Nang Lae, Chiang Rai. Golden Triangle, Wiang, Chiang Saen. Wat Phra That, Wiang, Chiang Saen. View from Sinakarintra Stit Mahasantikhiri Pagoda. Mae Salong Nok Chinese Village. Happy New Year! – May it be a prosperous one for all! All the best wishes for everyone of a very Happy New Year - may it bring good tidings and prosperity for you all. Best wishes from Chiang Rai, Thailand.